Welcome back. This is a continuation of a previous post. I suggest that you read the first part before this one, just so you know where I’m going with it. Superman poses an interesting contrast to the traditional mask in that he doesn’t wear one. It’s a constant joke among fans that no one recognizes him. I mean, how can anyone be that stupid? I’ll explain below, but first I want to talk about what makes Superman unique. 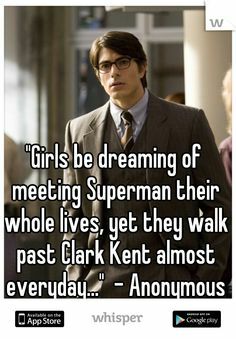 Both Clark Kent and Superman can be called his “true persona.” He was raised Clark, and until his powers manifested, he was an ordinary boy and unaware of his lineage. This parallels the classic stories of Hercules, Moses, Harry Potter, Jesus, etc. But when he comes into his power, Superman leaves Clark Kent behind. He still carries much of his personality and morality, but they are not the same. He smashed that shell like the many buildings he’ll smash in the future. When you can look at the Earth from a dozen miles up, you never look at it the same way again. I want to find who said this, but the writer is wearing a mask. But Supes wants to be Clark Kent again. He doesn’t have to lead a human life, but he chooses to. The “new” Clark Kent is Supes fantasy of what his life would’ve been like if he was a human, not a Kryptonian. In the movie Kill Bill, Bill claims that Clark is an example of how Supes see humans: weak, bumbling, and awkward. I say that it’s a mask, but the one Supes wears to experience some of his old life. Through his upbringing, he is neither human or Kryptonian, but a little of both. I wish they focused more on this in the recent movie, or at least the next one. As for nobody recognizing him, it’s because people don’t see the man, they see the mask (or uniform). Last year, Jimmy Fallon did a bit where he had Mets pitcher Matt Harvey ask people questions about what they thought of Matt Harvey. No one recognized him out of his uniform, and hilarity (sorta) ensued. People didn’t recognize Harvey–even though he was the hottest thing in New York–because he was out of uniform. It makes perfect sense to me that they wouldn’t associate Clark with a red and blue blur (Smallville reference). In my serial (and forthcoming novels) The Watchmage of Old New York, masks and disguises play an important part of the setting. The Dwellers–mythical creatures drawn into our world through people’s dreams and beliefs–all wear magical disguises in order to survive in the city. They know the cruelty of humans, and they understand the danger if they were discovered. When I devised that, I drew on a few scenes from Maus, where the jewish mice wear (polish) pig masks to move around the ghetto. Maus always had a strong effect on me. Most of my family immigrated before the Holocuast, but still. 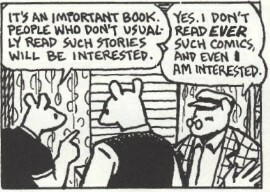 If you haven’t read Maus, start. I know that in real history, some Jews were able to hide their ethnicity, and even do it in America. Here, Jewishness (and all ethnicities) is in danger of being assimilated by the larger culture. They’re–if you will–being thrown into the melting pot. It’s tragic to immigrate and save your life, only to lose your identity. The Watchmage has to hide his identity as well. At the time the serial begins, he’s already 150 years old, and has lived several lives. Each time he has to build a new identity, but he doesn’t have the luxury of leaving and starting again elsewhere. He will spend all of eternity taking new identities, living many lives that are never his. I’m not the first person to point this out, but we all wear masks. You are not the same person at work as you are at the bar. You’re not the same around children as you are around the elderly. That’s normal. A person is not a piece of paper. A person is a gem with a thousand facets, and each facet shines with its own light. People are way too quick to judge another as “fake” when they see a facet they’ve never seen before. If we were to approach the world as a simple paper, it would surely tear us apart. The masks that we wear protect us from the world. I don’t know if you’ve noticed, but the world is not a pleasant place. I’m wearing a mask right now. So are you. You’re reading this through an interface, where you can use any avatar you want and reply as any persona you want to be. Hell, you can be Batman for all I know. We live in a world of masks now: Twitter, Facebook, blogs, they’re all masks that let you deal with the world around you. Don’t be sad. Don’t be ashamed. When Spiderman or Batman dons the mask, they become something greater than what they were. There’s no reason why you can’t too. Like my posts? Follow my website or “Like” my facebook fan page. You can also purchase my debut novel, Song of Simon, at any online bookstore or a real one (they both exist). And follow me on Twitter too.